Bloomberg Markets is a monthly magazine published by Bloomberg L.P. as part of Bloomberg News. Aimed at global financial professionals and provided to every subscriber of Bloomberg Terminal, Bloomberg Markets publishes articles on the people and issues related to global financial markets. karlssonwilker was commissioned by the magazine to redesign the publication from the ground up. Specifically, the brief called for the magazine to look and feel like a journal, with long-form interviews, and an articulated visual vocabulary. We worked closely with Bloomberg Markets’ editor, Joel Weber, to gain a full understanding of the background of the magazine, as well as its mission, needs, and goals. Various typefaces and grids were tested together with multiple approaches to photography and illustration, as well as general ways to structure content; from interviews, to articles, to bylines. 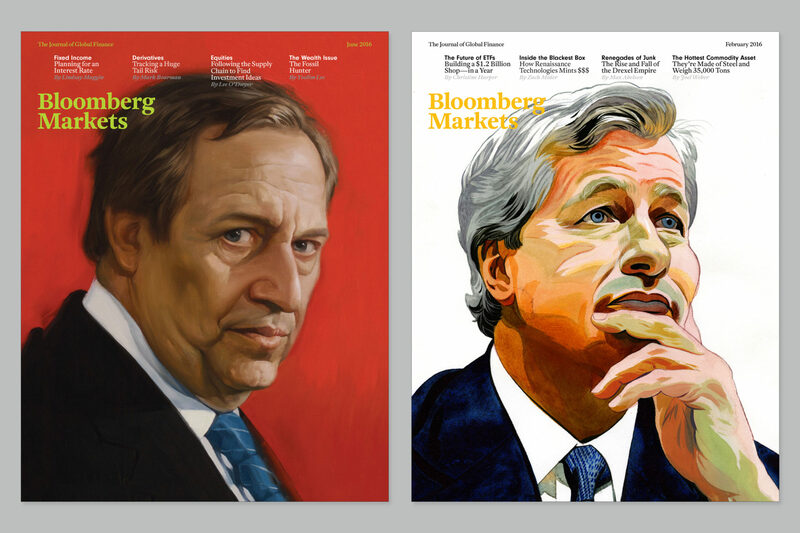 The end result was a new bi-monthly magazine that features long-form journalism paired with detailed financial analysis, all packaged by bespoke painted portraits for the covers. The cover portrait of the featured interviewee takes up to three weeks from when they are commissioned to obtain a print-ready file, an eternity in magazine publishing. However, this was a counterpoint to stiff, mostly stock CEO portrait photography featured on most business magazines. A bright color scheme was also introduced, changing slightly with every issue and cover. The Bloomberg Markets logo itself is a slightly customized Antwerp (A2 Type, London). The two typefaces in use are Antwerp and Balto (Type Supply, Baltimore), arriving at a typographic system allowing for a diverse application.